Easy-fit tap – foldable and portable. classic pole with easy-fit taps, or a telescopic pole with adjustable height. Fix the banner on the vertical pole. For banner mounting. Available in several sizes, with snap-lock or Velcro. FLEX-display™ offers a variety of bases for different types of displays. You can choose foldable bases or plate bases. Foldable bases are ideal when you need a lightweight portable system. they are stable, support the banner excellently, and can be folded into a bag togetder witd the rest of the system. Plate bases are heavier tdan foldable bases. their sleek design is elegant witdout taking attention away from your display. Bags are available for these bases too, to make them easy to transport. These are examples of different FLEX-display bases alone and in combination. All bases are manufactured from the same material, so you will obtain a clean, polished and uniform look even when you combine different sizes and types of bases. You can put them togetder to make up a display wall, or use them one by one to attract attention and give information. FLEX-display™ includes a range of accessories to enhance your display. With magnet clips, you can mount a literature holder on your display without changing it and without damaging the banner. You can also mount your own shelf for displaying products. 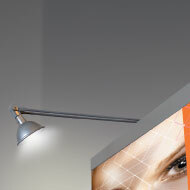 Halogen spotlights put your message in the best light. Our spotlights are easy to clip on and off, and designed to match the elegant design of the system.